In 1884 Haskell Indian Nations University began with 22 students as an elementary school for grades one through five. The university started as the United States Indian Industrial Training School where boys were taught tailoring, wagon making, blacksmithing, harness making, painting, shoe making, and farming. Girls learned cooking, sewing, and homemaking. The institute grew and expanded and in 1927 the first high school classes were accredited by the state of Kansas. Haskell eventually graduated its last high school class in 1965 and in 1970 became a junior college. In 1993 Haskell became Haskell Indian Nations University. The institute was named for Dudley C. Haskell, a Congressman from Kansas who was chair of the Committee on Indian Affairs and whose work brought the school to Lawrence. 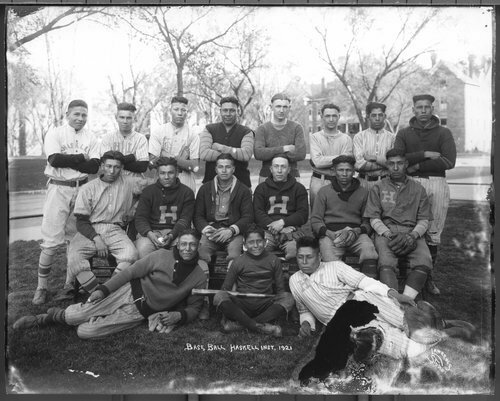 The university was also added to the National Register for Historic Places as one of the first large off-reservation boarding schools for Indian students.